This article is about snoring and about AirSnore best snoring remedy when co-sleeping with your baby. Have you ever woke up your husband during the night because you just couldn’t stand his snoring? Well, I have. And I did it not because it bothered me, but mainly because we were (and still are) sleeping with your little daughter in the same room. He was waking her up several times during the night, so it was a nightmare. We realized we had an actual problem at the time and we really tried to find the best solution to it. Obviously, moving the baby’s crib in another room was not a viable one. That would have been to hard to achieve, mainly because she was breastfed. On the other hand, our couch was not suited for sleeping on it, so moving my husband in the living room was not an option, either. In the beginning, my husband tried various products that would help him stop snoring, like nasal strips, nasal rinse or nasal dilators, only to eventually find out that there are four types of snoring (nasal snoring, tongue snoring, mouth snoring and pharyngeal snoring) and he was not treating his condition correctly. Soon after we figured out the was tongue snoring, we found the best anti-snoring products for all kinds of snoring. 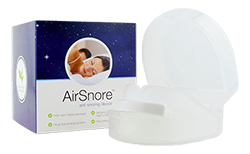 We were lucky to discover AirSnore and its effective drug-free anti-snoring products. The product is made from a special blend of natural oils well known for their soothing and antiseptic properties to help relieve your symptoms and send you to a relaxed good night sleep. 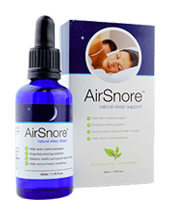 AirSnore Drops contain a special mixture of natural oils known for their soothing and antiseptic properties. These help relieve your symptoms and send you to a sleep without snoring. AirSnore Drops clear your airways and ease your breathing, while helping you fall asleep much more easily, ensuring you get the snore-free, full night’s sleep you deserve. You have to simply rub the AirSnore Drops on your chest, neck and under your nostrils in the evening before you go to bed. My husband was mainly attracted to the fact that AirSnore Drops are made of 100% natural ingredients: sunflower seed oil, eucalyptus leaf oil, lavender flower oil, peppermint leaf oil and Scots pine leaf oil, a combination that guarantees a peaceful good night sleep. Although my husband tried to use a dentist recommended anti-snoring mouthpiece before and he was not satisfied with it, he ordered the AirSnore Mouthpiece along with AirSnore Drops. It turned out that AirSnore Mouthpiece was a really useful acquisition. First of all because it wasn’t uncomfortable for him to use it during the night – it moulded perfectly in his mouth, without bothering his breathing or causing pain or discomfort. Secondly, because it allowed him to breathe more easily. If it doesn’t fit the first time you try it, all you have to do is place it into some hot water for a few minutes and re-mould it again until you got the perfect fit. It is as simple as that! You can order AirSnore combo – AirSnore Drops and AirSnore mouthpiece or each of the products separately with free shipping and return your order and all packaging within 60 days for a full refund if they don’t work for you. But, you probably won’t return them. They’re the most effective drug-free anti-snoring products we’ve tried.